The singer Yusuf Islam, formerly known as Cat Stevens, has received an honorary doctor of laws degree from the University of Exeter in Devon. He was honoured for his humanitarian work and improving understanding between Islamic and western cultures. Other well-known recipients honoured at the ceremony included Brian May, Sir Clive Woodward and Jonathan Dimbleby. Husband and wife Jennifer Saunders and Adrian Edmondson, who live on Dartmoor, both received doctorates of literature. Before the ceremony Ms Saunders told BBC News she was both nervous and excited. "Its appearing as yourself that is the most nerve-racking thing which I really don't do an awful lot of - I certainly don't make speeches, ever," she said. "I'm terribly intimidated by educational places, professorships, chancellors and all that kind of stuff. It makes my palms sweat slightly." 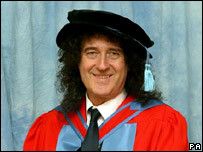 Rock group Queen's lead guitarist Brian May was awarded a doctorate of sciences for his interest in astronomy and physics. Devon resident Jonathan Dimbleby was honoured for broadcasting and his work with the Soil Association and the former England Rugby Union coach Sir Clive Woodward was recognised for his achievements in sports and management. The University's Chancellor, former children's television presenter Floella Benjamin, presided over the ceremonies. She said: "This is the most exciting time of year on university campuses around the country, and I'm delighted to be welcoming such well-known faces to Exeter to celebrate alongside our students and their families." 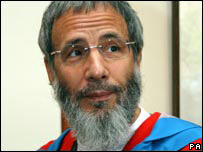 Yusuf Islam, who converted to Islam in 1977, told the graduates his religion had brought him inner peace and happiness and it was not a religion of terror.